Our North6 Project came to us with a bit of a challenge. To create a cohesive design that would marry this Antique Style Cape to their new addition. While also incorporating the clients personal style of coastal comfortable. As a coastal girl herself Designer Tena Collyer knew exactly how to execute this project. She incorporated the timeless white kitchen with pops of sea glass colors. To do this Tena used Omega Cabinetry in Pure White and then created that custom look with an island in Dove. She tied it all together with antique lanterns above the island by Visual Comfort Co.
'Wow! What a view!' is the first thing our Shore Acres clients hear when they have people over to their brand new South Dartmouth home. The second thing is 'Wow! What a gorgeous kitchen!'... and that's where we come in! We had so much fun designing this Coastal Living Magazine worthy kitchen, focusing on sea glass hues with a few pops of transitional style. The photos speak for themselves! Windrush... Danielle's 1st Completed Kitchen! Our Windrush kitchen remodel is complete! This is extra exciting because it is Danielle's first completed kitchen! We are so happy to have her as a part of her team. This kitchen remodel features Plain & Fancy Custom Cabinetry in a Buttercream finish; Symphony Viatera Quartz Countertops, and Oil Rubbed Bronze Hardware by Schaub. 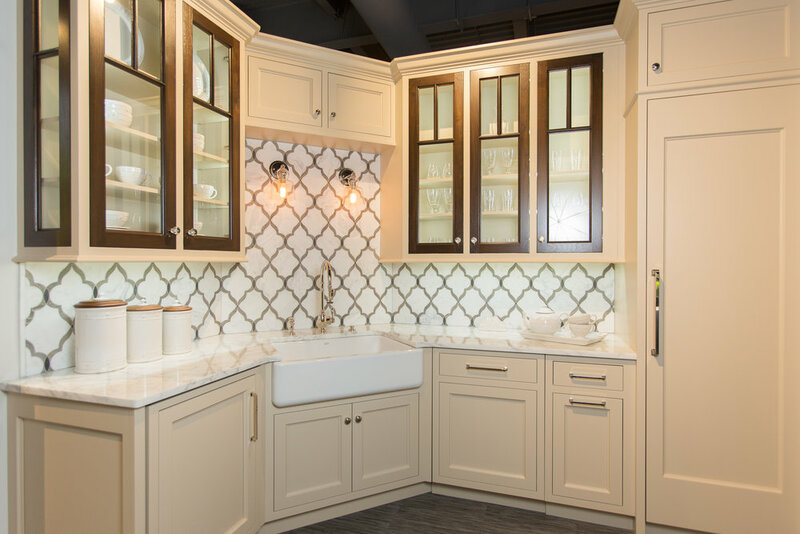 "We highly recommend K & B Details.. Tena and Jill each brought their own expertise to our kitchen and bath remodel. The process from our first meeting through to completion was outstanding. What amazed us was how they became part of our team. When we weren't sure of something they were right there to help. When you decide to hire this company, the point of sale is the beginning of your partnership with them not the end. They are professional, talented, and compassionate, putting the client first , and getting the job done. We LOVE our kitchen and bath! 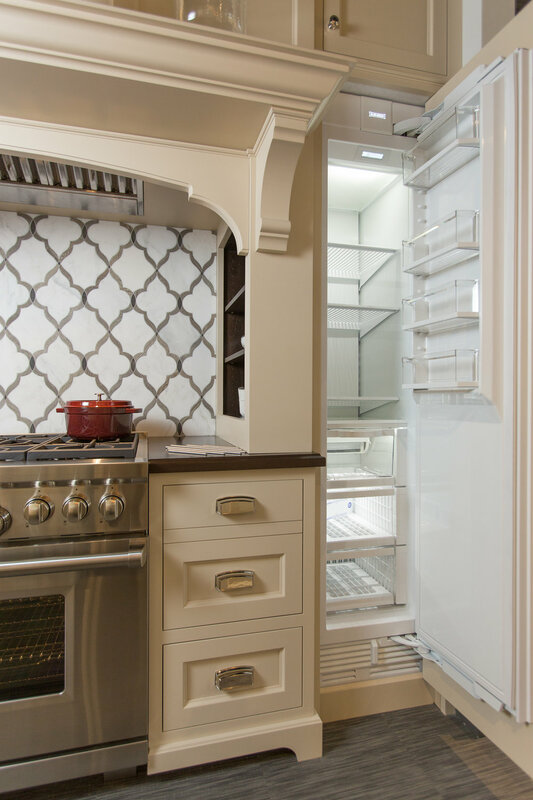 Thanks for everything :)"
Here are some photos showing off some beautiful Plain & Fancy Cabinetry and Wolf Appliances! Our fully functional kitchen is not only great for cooking demos, but it makes a perfect place to meet up with some friends and have a cooking party! Last week we hosted a Creative Cooking workshop where each participant prepared 10 freezer meals. SubZero 36" Built In Refrigerator/Freezer Display SALE!!! Contact us today if interested! This unit will not last long at this price! Designer Jennifer Richards, of Tapper Richards Interiors, approached us to collaborate on a office remodel project. It was a pleasure working with her to create a functional, but aesthetically pleasing space! Check out her blog post for her point by point review of the project. This was such a fun collaboration with Jennifer and the client was thrilled with the end result! What more could you ask for?! Our Church Street kitchen remodel project is complete! Some unexpected water damage in this home led to a gorgeous brand new kitchen! Our Park Street Kitchen remodel is complete! This was such a wonderful job to work on... we had the sweetest of clients and a phenomenal contractor. Our front display has a new home! We recently sold our front display to a lovely couple building a home in South Dartmouth. It was so nice to go out to the house and see our display incorporated into a gorgeous new kitchen! We are very excited to offer the full line of Wolf Gourmet countertop appliances! Come by our showroom to see the line in person today. Our Harbor Beach Summer Cottage remodel is complete! Our clients completed a full rehab of their summer cottage over the winter. We wish we had 'before' photos, but the home was already gutted by the time we were called in to start our part of the job. 'We have a small cottage that still had the original kitchen from the 1950’s. We made the decision to make updates and hired Kitchen & Bath Details to do our kitchen. They did not disappoint! The kitchen is now done and is fabulous. From the start, both Tena and Jill were extremely professional and helpful, making suggestions and steering us in the right direction on the kitchen design. There was a lot we wanted to include in a relatively small space and they were able to create the perfect design that made efficient use of the space while still incorporating all of our needs and wants. In addition, Tena and Jill connected us to the right appliance and stone vendors and they followed through to make sure the install and final outcome was perfect. We had a small glitch in the install of the Quartz countertop and Jill worked with the stone vendor to make sure the issue was fixed quickly. Tena and Jill made sure every “i” was dotted and every “t” crossed. We are very excited to welcome in a new member to our team. Meet Kacey! She will be our sales assistant and that friendly voice you will hear any time you give us a call!! Stop in soon to say hello.